Hello Peeps! It’s me again~ Recently I’ve shared lots of my personal thoughts on my blog and today I'm going to talk about my favourite pairs of shoes. If you’ve followed me for quite a while you probably noticed that I don't have lots of shoe in my wardrobe. It's not because I never shop but I prefer to wear shoes that are comfortable, nice and mostly matches with all of my outfits. If you ask me to pick among all of my shoes I have two pairs that I love the most. One will be my recent favourite Jelly Bunny New collection flats which I can't live without and another one is a sandal heel that I got it 3 or 4 months ago. Never thought that I'm going to mark this as one of my best 2 favourite pair of flats over all my others heels. I love this so so so so much. No matter what I match with either a skirt , shorts or a skort, it look really good and easy to mix & match with. I got this last week and I can't believe I wore it for more than 5 days within 1 week. 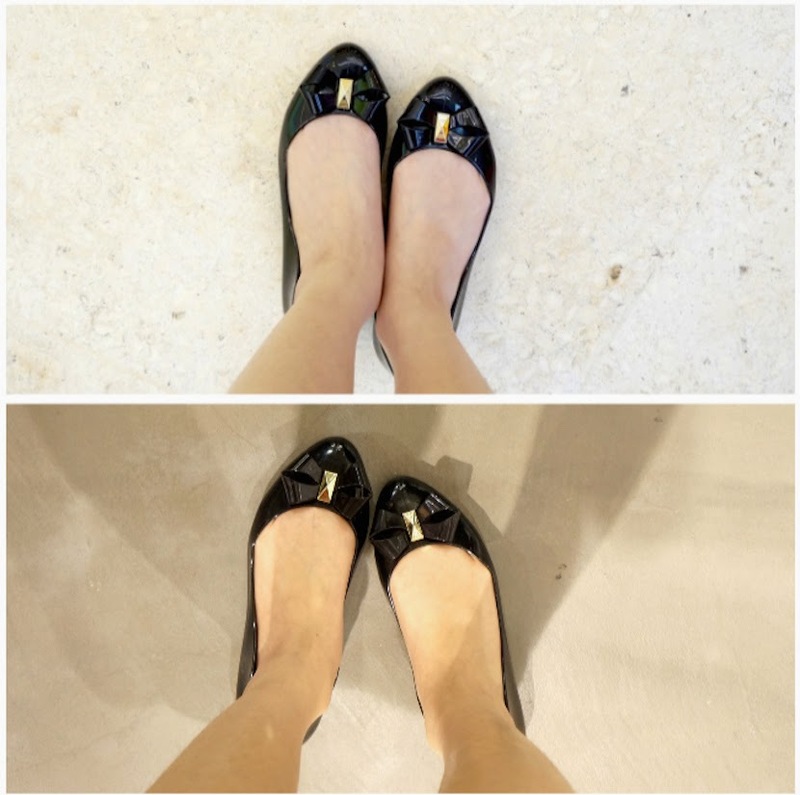 Let me show you two outfits that I match with this lovely flats. Other than that the comfortable level of this flats is 5 stars out of 5! I can't believe that among all my other flats this is the most comfy one! It didn't hurt my leg and I feel so good when walking with this flats. I have no idea but most of the flats that I bought hurt my leg so much but this one won't! I'm just loving it!! Wore this out for a brunch with my girls and the next OOTD will be having another outing with my mom. It's my first time step into Jelly Bunny shop and all of their new arrivals caught my eyes. I'm loving this and another pastel blue with a cute little logo on it one. Guess you guys should check this out and their stores available in most of the shopping complex! Next ootd trying to look good in black and white so I just match my white cropped top with a skort and of course with my gorgeous flats from jelly bunny too. Now I know where to get nice flats that not hurt my leg. I love the softness of the shoe and I picked this because I think the ribbon and studs is just too cute to be together. It's a combination with black and gold colour. Slightly diff from what I prefer but black look really easy to match with any outfit too even if it's a dress it still looks very good. Other than the flats, I'm loving one of my black sandal too. I have no idea how many time I wore this but definitely one of the best heels that I had. Personally I think no matter it's a heel or just a normal flats most important is their design and also the comfortable level. Of course, you should pick your favourite too and I'm curious about your favourite pairs of shoes. Most of the time I will get black shoes rather than white because black really look good in everyone especially for those who prefer easy mix and match item like me! Or lazy to think what to wear on the bottom. Black flats or sandal heel will never go wrong! Here's my new favourite and I'm going to purchase another pair from Jelly Bunny again next week before CNY. Hope the pastel blue one still available in my size! Mama going to get you home!! HAHAAHAH. Oh yea, other than that I'm going to share with you an awesome GIVEAWAY from Suria KLCC!! They are giving away a grand prize of RM2,000 shopping spree on the Suria Shopping Spree until end of 31 December 2014. For those who interested what you need to do is just participate it just need to complete this 3 simple steps! If you spend RM150 at any of the participating footwear stores, flash your coupon on the smartphone to the concierge staff at concourse level and you may be one of the lucky 10 people per day to redeem a gift from Skinfood or Benefit!